Our first post in a series of the 10 most influential books I’ve read this year – 2011. Peter Fitzsimons, Kokoda: The masterful and gripping account of Australia’s legendary Kokoda triumph – our most important battle; Hachette Australia; Sydney; 2004. I don’t read too many books that aren’t related to business. And, I usually don’t read books that are 481 pages in length. This is perhaps the longest book I’ve ever read! I made a big exception here and it was worth it. For a long time, the story of the Gallipoli campaign in World War One had stood as the defining event in Australia’s war history. And, in recent years Kokoda was emerging as a rival story. I’d heard so much about Gallipoli and so little about Kokoda. 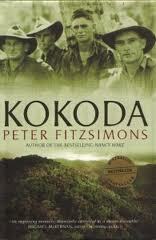 I read this book to find out why the fuss about Kokoda. What was I missing? • The personal lives of individual Australian soldiers who fought so bravely against such huge odds. • Plus the Japanese view of Kokoda, especially their single minded pursuit of victory. “There can be no deeper spiritual basis for the meaning of the Australian nation than the blood that was spilled on this very knoll, this very plateau, in defence of the liberty of Australia. This was the place where I believe the depth and soul of the Australian nation was confirmed. If it was founded in Gallipoli, it was certainly confirmed in the defence of our homeland.” P477. In other words, whilst Gallipoli was a fight to protect the Commonwealth, Kokoda was the fight to protect Australia itself. And, the heroic men that fought along Kokoda deserve all the recognition they can get. Read this if you’re interested in Australia’s identity. It changed my sense of who we are.